Since the first days of Encyclopedia Virginia we’ve thought of our audience in a couple of different ways. In one sense, it’s anyone in the world with an Internet connection. And most of our traffic, as you might expect, comes from folks who type search terms into Google and, Voilà! The gods of the web lead them to our door. But when actually building a site like ours it’s not always helpful to think of the audience that way. How can you make decisions about best serving your readers when your readers could be anyone? For that reason we identified what we think of as our primary audience—the people for whom we hope to make EV the most useful. These are educators and students. We still aim to serve everyone else, too, but we spend a lot of time talking to teachers and administrators about how EV works for them and how we can make it work better. When names like Christopher Newport and Oliver W. Hill showed up in the state Standards of Learning (SOL) and we didn’t have entries on them yet, we heard from teachers and got on it. When social studies teachers told us they needed primary resources, we got on that, too. Lately we’ve been hearing about the need for what teachers call “scaled” entries—or entries written with different grade levels in mind. We considered doing this early in the project but found it to be too unwieldy. We couldn’t write each entry four times, could we? One for an average adult, and three more for students from first grade to high school. We’ve become both more ambitious and pragmatic over time, however. And our thinking now is that we may try to produce scaled versions of some of our entries that are mentioned specifically in the SOL. For first-graders, that means Newport, Pocahontas, Powhatan, Maggie Lena Walker, and Arthur Ashe. After the jump you can read drafts of those first three. Let us know what you think, especially if you’re a teacher. In the meantime, we’re also thinking about how to present this on the site. We are forever a work in progress! Powhatan was an American Indian leader. The Indians lived in Virginia first. They hunted. They farmed. They grew corn. They found nuts and berries in the forest. They fought each other in small wars. The Indians lived in small towns. The towns were near rivers. That made travel easy. They used canoes to visit each other. Indians wore clothes of deer skin. They painted their faces. Powhatan ruled over many Indian tribes. There were about 30 tribes. They worked together. This made them stronger. Some tribes didn’t want to be ruled by Powhatan. He used force. He didn’t give them a choice. Tribes paid Powhatan in food. He protected them from enemies. 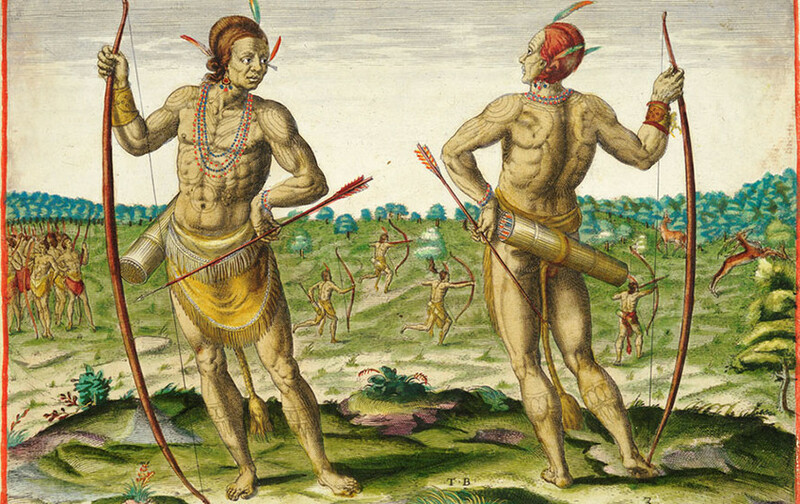 Powhatan’s biggest job was to defend his people. The English came to Jamestown. Powhatan didn’t know if they were friends or enemies. They could be both. They gave the Indians gifts. But they also took the Indians’ food. Powhatan worried about how to defend his people. The English didn’t have enough food. They didn’t know how to farm. They were poor hunters. The Indians didn’t have enough food, either. It hadn’t rained. Even the animals were hungry. Powhatan helped the English. His daughter was Pocahontas. He sent her to their fort. They welcomed her. She gave them food. The English kept taking the Indians’ food. The Indians and the English fought. People were hurt. The Indians stopped giving away their food. The war lasted for five years. Pocahontas helped to end it. Powhatan led Pocahontas marry and English man. The two sides came together. The war ended. Pocahontas married John Rolfe. They visited England. Pocahontas died there. Powhatan never saw his daughter again. Powhatan stayed in Virginia. He lived to be an old man. He died in 1618. His brother became ruler of Powhatan’s people. Christopher Newport was an English ship captain. Christopher Newport was born in England. His birthday was December 29, 1561. His father worked on ships. So did Newport. He sailed around the world. England and Spain fought on the seas. Spain sent gold from America across the ocean. English ships tried to steal it. Newport became a captain. He fought for Spanish gold. He lost his right arm in battle. War ended with Spain. England decided to build a fort in America. Newport led the three ships. Each ship had a name: the Susan Constant, the Godspeed, and the Discovery. Newport’s job was important. He had to sail 104 men across the ocean. He had to keep them safe. The trip took five months. The three ships landed in Virginia in 1607. Newport explored the new land. He and his men sailed the rivers. They walked through the forests. They built a fort. They called their new town Jamestown. They called the new land Virginia. People lived in Virginia. The English called them Indians. Their leader was Powhatan. His daughter was Pocahontas. They helped the English. But the Indians didn’t have enough food. The English didn’t either. They needed more people and supplies. Newport again had an important job. He sailed back to England. He gathered more people and supplies. He returned to Virginia. One of his trips ended in a shipwreck. Newport’s ship ran into a storm. It crashed on an island called Bermuda. The ship had 150 people. There were men, women, and children. They lived on the island for ten months. They built new ships. They used wood from the old ship. They also cut down trees. Finally they sailed for Virginia. Newport didn’t stay in Virginia. He sailed all over the world. He saw India. He traveled to South Africa. He died there in 1617. Pocahontas was an American Indian girl. The Indians lived in America first. They hunted. They farmed. They grew corn. They found nuts and berries in the forest. They fought each other in small wars. The Indians in Virginia lived in small towns. The towns were near rivers. That made travel easy. They used canoes to visit each other. Powhatan was the father of Pocahontas. He ruled over many Indian tribes. Powhatan and his people lived in Virginia. The Indians called it by a different name. Powhatan’s biggest job was to defend his people. The English came to Jamestown. Powhatan didn’t know if they were friends or enemies. They could be both. They gave the Indians gifts. But they also took the Indians’ food. She helped her father. She helped cook big dinners. She gathered wood for fires. She was his favorite child. The Indians didn’t have enough food, either. The weather was bad for farming. The rain didn’t fall. Even the animals were small and hungry. Powhatan helped the English. He sent Pocahontas to their fort. Everyone loved Pocahontas. They welcomed her. She gave them food. The English still took food. They didn’t ask. The Indians and the English fought. People were hurt. Powhatan made a plan. He let Pocahontas marry an English man. The two sides came together. The war ended. The husband of Pocahontas was named John Rolfe. He loved her very much. John Rolfe took Pocahontas across the ocean. He took her to London. She met the king. She met John Rolfe’s family. She also became sick. Pocahontas died in England. Under WEDDING it says “Powhatan made a lan. Don’t know what that should say. What does “small wars” means? They were kind of playing war games and not killing each other?